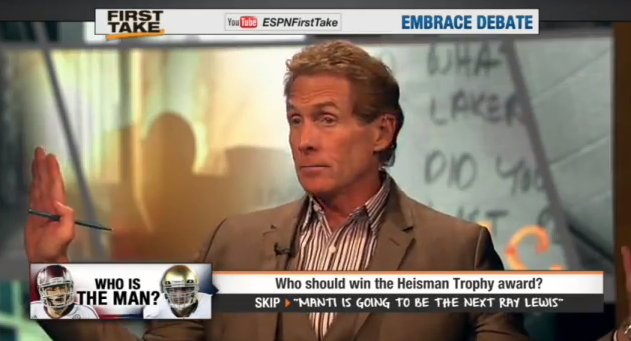 Skip Bayless will leave ESPN in August when his contract expires: headed to Fox? With this release suggesting this was Bayless’ decision, it would seem logical to presume he already has a landing place, and there’s one that absolutely fits: Fox. Fox Sports’ cable channels are led by president of national networks Jamie Horowitz, who created First Take at ESPN and has made no secret of his desire to further embrace debate and to potentially land Bayless. A big question is if Bayless will be able to draw numbers on FS1 and not ESPN, though; while Cowherd’s FS1 show has improved on what was previously in its timeslot, it only brings in a fraction of his old ESPN audience. Can Horowitz really build a network on hot takes alone? Regardless of if Bayless does land at Fox and how well that could work out, though, his exit from ESPN alone is a huge story. For all the criticism Bayless (deservedly) gets, he (and co-host/foil Stephen A. Smith) have managed to consistently draw massive ratings for studio programming. ESPN has made it very clear that they value Bayless and his brand of debate, and that they’re much concerned with the ratings these guys bring in than the questions they raise, so unless there’s been a big change here, it seems likely that they wanted to keep him around. It’s likely that they just got outbid, though; ESPN’s financial challenges are well-known, and they’ve been emphasizing versatile personalities, and Bayless has been target number one for Fox. Still, this combined with the exit of Tirico and other big names is further evidence that ESPN can no longer hire and keep whatever talent they want. There are huge questions to ponder about what this means for ESPN in the larger picture and who they’ll replace Bayless with. Will they continue to embrace debate once their star debater leaves, or will they let Fox have that turf and go in a different direction? For now, all we know is that one of the biggest faces of the brand (for good and ill) is on his way out. Update: SI’s Richard Deitsch writes that his sources say Bayless is likely to make $5-6 million annually from Fox, and was only offered $4 million annually from ESPN. Pingback: Curt Schilling wanted to work with Fox Sports... and Fox said no?? ?